In this series, we’ll sit down with the president of the International Federation for Emergency Medicine and talk about the unique opportunities and challenges faced by the organization. EPI: As a long-time leader within the international emergency medicine community you’ve had plenty of experience negotiating expectations between varying groups. What is a piece of wisdom you’ve learned along the way as far as forming global coalitions and strategies across cultures? Dr. James Ducharme: Setting up a healthcare model can’t be based solely on my experience in Canada or someone else’s experience in the United States. You have to understand that at the base there are building blocks in place. It’s just like putting Lego pieces together. People are going to put their building blocks together in a model that suits them, not in a model that suits the United States or Canada. You have to consider the cultural aspect of each nation so that when you provide advice it will help your colleagues build a model that suits their culture and their beliefs. When you are interacting with people (and this is difficult) you have to understand their cultural background to some degree so that you can communicate ideas in ways that will be acceptable. If you’re an emergency physician who is “growing up” in the international model, and you’re starting to serve on committees and such, you have to listen a lot to understand how others are thinking so that by the time you get to more of a leadership role you at least have some understanding of why they are thinking the way they are. Then, when you bring ideas forward, your colleagues might see things differently, but they are going to at least consider them and not be put off by them. That’s what I’ve learned with time. EPI: Can you give an example of how this looks in practice? Ducharme: Let’s say you’ve been to India and think you understand India. India is a country, with a diversity of cultures and systems from what I can see. There are so many different sub-groups and cultures that it would be almost impossible to build a single health care model acceptable to all. So how do you find compromises? It’s just so big. Is the answer the installation of more than one model, varying from region to region? To go there and try to understand what you might suggest or apply might be valid for a group of private hospitals but would not be true for the national healthcare system. You have to listen. You cannot somehow ‘know’ ahead of time, unless you’re have spent years in a given country to learn how they think and cultural assumptions they make proposing a system requires therefore listening very carefully to the people’s viewpoints. Ducharme: I think the biggest challenge is the paradigm shift that is required at this point in time. We started out as a group of motivated, passionate people who wanted to communicate and network, who wanted to get together for education and for social reasons. We wanted to heuristically improve emergency medicine through “organic growth,” as Peter Cameron would say. And you know what? Given that paradigm, that mindset, IFEM has succeeded very, very well. But that paradigm can last only a certain amount of time and defeats itself with success. 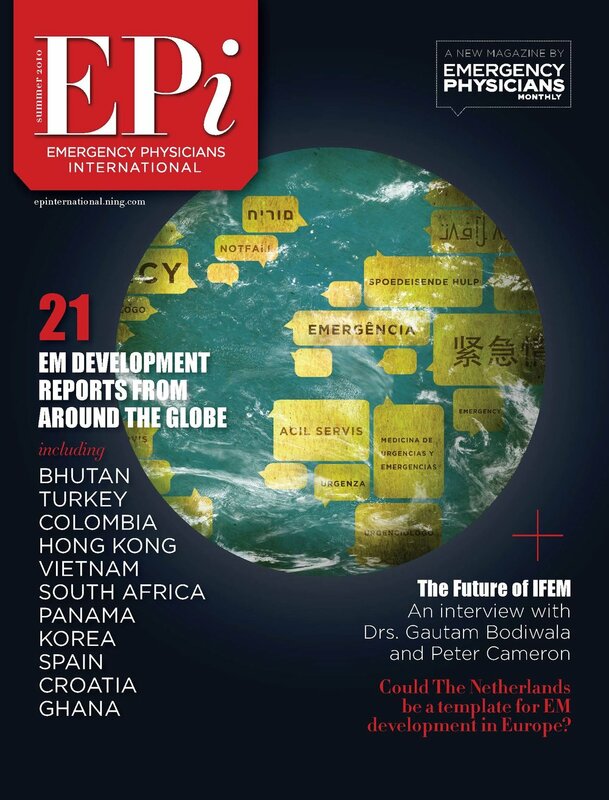 At some point as IFEM grows, as the commitment to growing emergency medicine occurs, the paradigm has to become, “we’re now a business.” Whether you call it a business or a formal organization, it becomes necessary to take the next steps so that members no longer serve merely as volunteers, saying, “I’ll participate as I can,” to much more of a “this requires attention every week.” Members of the organization need to realize there are time pressures as in any business. Yes, things move slowly, but we still have to be very responsive. This paradigm shift means that there has to be a funding model in place because if we’re going to be an international organization that truly reaches out across the globe, we have to understand that there are very few countries where physicians can be in executive positions, pay for international travel and protect all of the time requirements for working in the IFEM. There are many countries with great people who can’t afford to travel. They can’t afford to do the work that is necessary in a leadership role and give the time that’s necessary. So we’re talking about shifting from a loosely organized society or federation to now a federation that wants to become more organized, have a business model, be sustainable with funding for a proper head office, to be timely in responses, and have people dedicated to giving time every week. EPI: That sounds like a challenging shift in mindset. Ducharme: After 27 years of people thinking in the first paradigm, you can imagine that shifting to the second paradigm is going to make an incredible number of people uncomfortable. It’s not because we don’t want those people, because we do, but we understand that the people who said “well I’ll do this when I have time,” may find it very difficult to give time every week, and schedule and review things a certain way. That’s a huge paradigm shift when we all have full-time jobs. So that’s the biggest barrier. As you know if you’re a business person, there’s the curve of change management. There’s always “storming before there’s norming.” There’s unsettlement. Some people might just say, “you know what, I’m not interested in this type of model,” or “I just can’t commit the time necessary.” Some people may find it difficult but will succeed in changing the mindset. But to get us to a business model where we have a proper number of head office staff, where we have funding in place when we need leadership coming from a less developed country to pay for their travel, to be able to commit to projects with governments or NGOs and deliver on time, that change in mindset is essential. The desire to make emergency medicine important and necessary around the world is there. You can’t speak to a single person in our committees or the board of IFEM that doesn’t believe in the growth of emergency medicine. That’s why they’re there. We will continue this conversation with Dr. James Ducharme next week. Dr. Jim Ducharme is a clinical professor of medicine at McMaster University in Hamilton, Ontario, who has researched and taught about pain for the last 20 years. He is currently the president of IFEM, the International Federation for Emergency Medicine.